I get the attached Malwarebytes pop-up notice stating that the web site is blocked due to spam. It will pop-up two times then I will not see it again unless I re-open this one thread. It does NOT block the website or thread. Strange, indeed. I am running Windows 10 on a desktop pc. I am running both Malwarebytes and Norton Security. I am using BMWLT.com classic view. 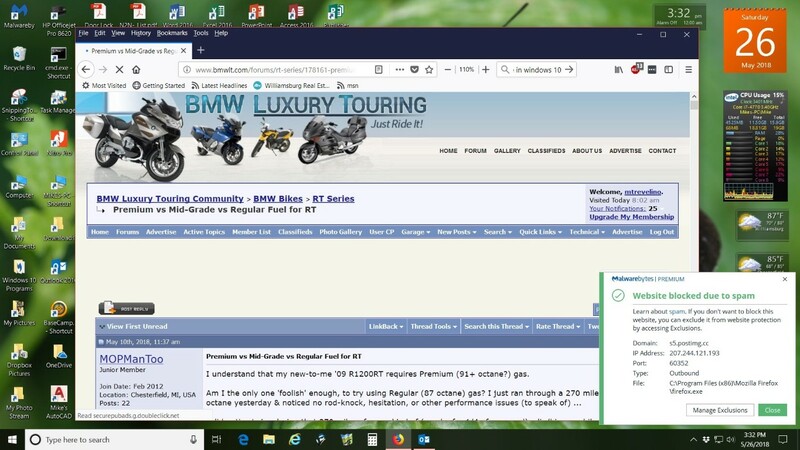 I am using Firefox but I receive the same pop-up in Internet explorer. Last edited by mtrevelino; May 26th, 2018 at 2:49 pm. That is very odd! My set up is very similar to yours, except that I don't have the malware program that you use. Could it be that it is giving you a false hit? Just read this story which came from another motorcycle forum I subscribe to. VerticalScope owns this forum. I also saw a post a couple days ago talking about the fact that the forum is not https: enabled. In today's age, it's super easy to get a certificate and should be required for any website today. I just don't think the owners/administrators of this forum are being responsible and for that reason I'm deleting my account. I figure it has to be false hits as it does nothing to the page or website I am viewing. It will just pop-up a couple of times and go away. It is strange that it only happens on the one thread. In your screenshot, you see where it says "Domain" in your Malware Bytes warning? postimg.cc is a photo hosting site, like Photobucket or tinypic. I guess the way that site communicates with your browser looked suspicious to your protection. Thanks Kevin for checking into this. I went back into that thread and received NO pop-up.